TBQ'S Book Palace: [Book Discussion]: "Surrender"
Pat and I are going to do a different type of review here on TBQ's Book Palace, we are going to do a joint review/book discussion but instead of us both reading the book – I read the e-book and Pat listened to the audiobook. 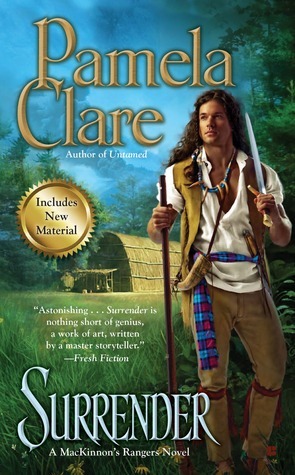 The book we’re discussing is Surrender by Pamela Clare. The book has just recently been released as an audiobook with the fantastic Kaleo Griffith as the narrator. First off Pat let’s talk about the narration. I am not one who listens to audiobooks – I have listened to two (I will confess both Pamela Clare ITeam books narrated by Kaleo) audiobooks in the past. I am not sure if I will listen to Surrender. Pat I know you love audiobooks – can you tell everyone why you love them so much? Pat: I don't listen to music in my car, and can't tolerate talk radio, so when I had to commute, I always had an audio book. It's become a habit even though I am retired. I actually like to listen to books I have already read, gives it a whole new depth to the story. If I'm in a good spot, I carry it in the house with me and clean, do dishes, or laundry. Makes my housework not so boring! Is a historical audiobook different for you than a contemporary audiobook? Do you listen differently; same place, as quickly as when you read a contemporary? P: I find no difference in a historical or contemporary as far as listening to it. So much depends on the narrator. As far as speed, I tend to go slower with an audio book; I listen, as I said, mainly in the car. K: I found when I read Surrender I read much slower than I do when I read contemporaries, I wonder if when I read the next book if I will speed up. Surrender is a historical, and I will confess it was the first historical novel I have read in say 15 years. Do you read or listen to a lot of historical novels Pat? What draws you to historicals. K: I must say a Pamela Clare historical is so riveting. It is full of fantastic historically accurate detail, but has a depth of story you see in her contemporary novels. I found I read slower, something I had to savor. I think I will start Untamed the next rainy Saturday I have. Okay now to our Surrender discussion. Annie defies her uncle and is punished. I will admit here the first chapter of the book was an intense. I had deep emotions for Annie when I read that – how was it listening to it? P: Totally amazing. You could feel her fear and pain, and the devastation of living in a filthy cell, with no windows and devoid of human contact. Not to mention the betrayal of her beloved uncle who she had come to think of as a father. The evil in Lord Bain was chilling, literally made me shiver. K: The other scene that I wondered how the intensity would be portrayed was when Iain rescued Annie from the attacking Indians. P: A great scene. The confrontation between Iain and his brothers was quite heated. They wanted him to leave Annie and carry on the mission. By saving her, he was putting them all in danger. The description of Iain watching her trying to escape, watching her fall and then the Indian raising the tomahawk and striking her; you could feel his anger and protectiveness overpower his ability to just walk away. K: Kaleo does have a way to bring the intensity to the narration doesn’t he? What was the most intense scene for you to listen to? P: Without a doubt, it was the scene of Iain’s flogging. It was so intense. The description of the drums beating, and Iain in chains, removing his shirt, and the crack of the whip! Annie was in such inner turmoil, feeling it was her fault, and her bargain with Lord William to lessen the number of lashes which outraged Iain. You could feel her heart breaking at every stroke. K: That was another one so hard to read, I bet you could hear the protectiveness Iain felt for Annie in that scene. Do you have a favorite scene? P: So many wonderful scenes! I think my favorite was the wedding scene. Her beautiful gown, surrounded by Iain’s brothers, and all the Rangers. Dancing and being totally carefree for just a night. There was so much love. K: Great scene and I enjoyed when they found the priest! For me it was the Epilogue; I know it’s the end, but I got choked up. Do you have favorite character? P: Believe it or not, I loved Killy, nothing like a wisecracking Irishman to brighten up a story. He had such devotion to Iain and Annie, in his own way; I fell a little in love with him. K: Killy is a great character. I did love Iain (as any lass with a bit of Irish in her should) but for me it was Annie. She had such great inner strength, to come from being waited on by servants to becoming a servant, and then assimilating herself into Iain’s life so easily had me in awe of her at times. Since you have read Surrender and listened to the audiobook I have a unique question. Was there a character that you changed your opinion about after listening to Kaleo’s narration? P: Lord William from the first page was an enemy to the Rangers. When it was perceived he was going to take advantage of Annie, I looked at him as pure evil. But, when it was his doing that essentially saved Annie, and allowed them a life, and released Iain, I changed my opinion......... a little. I can't say enough about the narrator, Kaleo. His Scottish accent, his Irish accent, and what I would picture the "prissy" voice of Lieutenant Cooke was perfect. His voice is how I judge narrators for the books I read. Not many come close. Kame: I am leaving my mind open about Lord William he is not on my favorite character list – but I recognize how important he is to the trilogy. Wow this was fun Pat! Thank you for talking about Surrender with me. Pat: Thank you so much Kame and TBQ for allowing me to participate. I hope we can do this again soon. Special thanks to Kame for coming up with all the questions, and making my job so easy! Kame: Thank you Pat – writing the questions was fun. Now each title in Pamela Clare’s McKinnon series is available in audiobook now. Kaleo has narrated them all. I have been told not to listen and drive; some scenes cause intense emotions and need for tissues! I can’t imagine Kaleo as Iain – but I plan to listen soon! Kame and Pat both bought their own copies of this book. Have you read Pamela Clare's books? Do you have a favorite?